Lassie may have saved Timmy’s life in more ways than one. 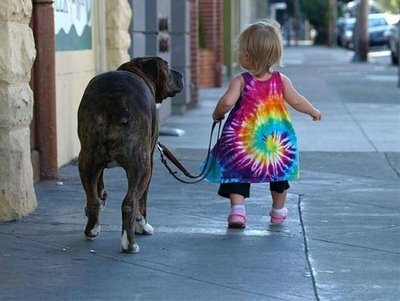 Owning a dog can make children more active and in turn less fat, two new studies report. While the social, psychological and physical benefits a pooch can provide have been well documented, less known outside of children’s literature and movies is what they can do for kids. Add 357 steps or subtract 11 minutes of sitting for dog owners over the petless, a study of 2,065 English children found. And an Australian analysis of 1,145 children found girls and boys with dogs 50 per cent less likely to be fat. “If you’re a kid and a dog, you chase balls, you play soccer with them, you rumble with them, wrestle them on the carpet even if you’re watching TV,” said Jo Salmon of Deakin University in Victoria, Australia. “It’s activity and it’s a mind thing as well.” Children whose families owned dogs were more active, with increased light, moderate and vigorous physical activity, regardless of race or gender, reported Christopher Owen, an epidemiologist at St. George’s, University of London, who led the English study. “The more active lifestyle of children from dog-owning families is really interesting,” he said. “Is it that owning a dog makes you more active or active families choose to have a dog? It’s a bit of a children and egg question.” Owen’s study concentrated on 9- and 10-year-olds in London, Birmingham and Leicester. Salmon’s followed children 5 to 6 and 10 to12. Nearly one in four smaller children and 37 per cent of the older children walked a dog at least once a week, Salmon reported. Parents who caved in to their children’s pleas for a dog won’t be surprised, however, to learn that adults in dog-owning families ended up getting far more exercise on the end of a leash than their offspring.